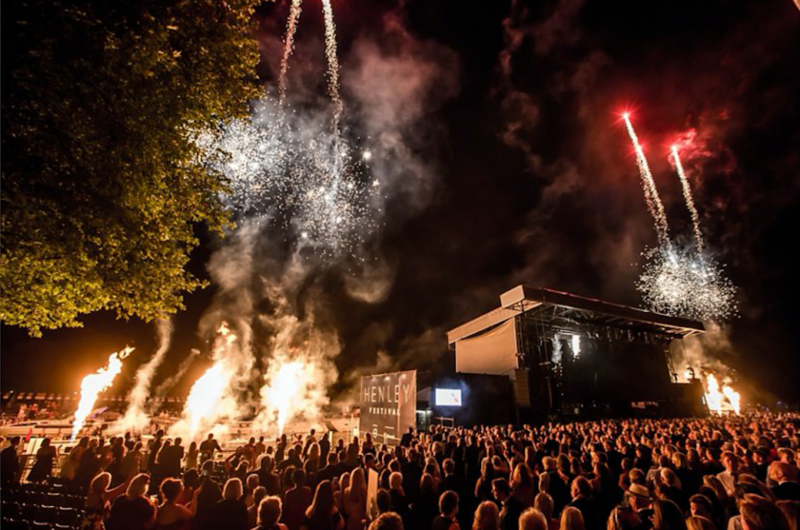 The Henley Festival is a prestigious event celebrating the best of UK arts and music which has just marked its 35th year. 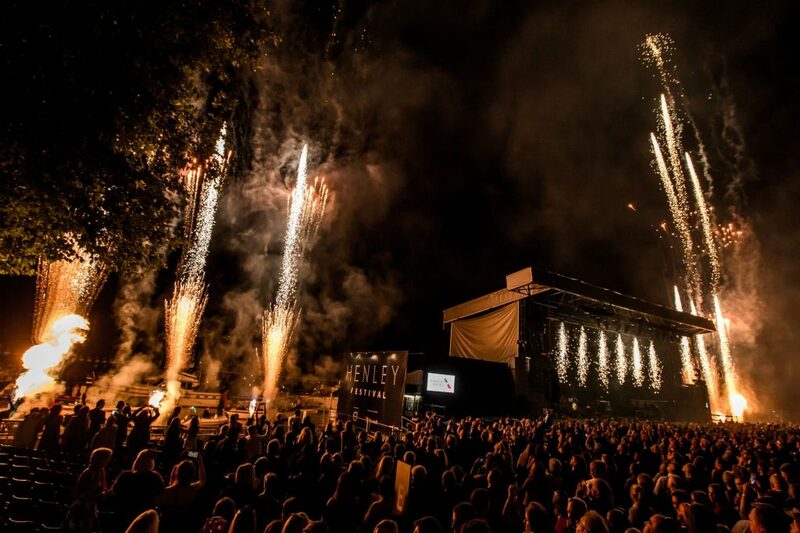 The festival follows on from the world famous Henley Royal Regatta and traditionally the five nights of entertainment have been closed with an aerial firework display fired from Fawley Meadows on the opposite side of the Thames, some 300 metres up river from the stage. 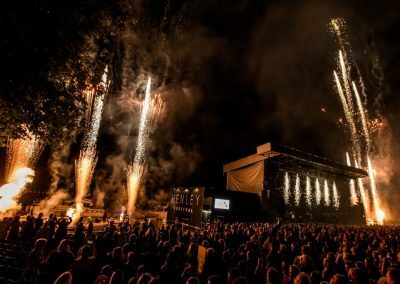 The organisers felt that this made the finale feel rather disconnected from the main event, so for 2017 they wanted to create something that was more intimate and immersive for the paying audience. Normal fireworks were not appropriate due to restrictive safety distances to the audience and boats on the river, coupled with a sloping roof over the main seating area which hampered the view of those on the rear row of seats. 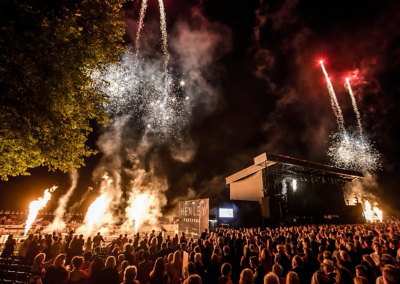 Not daunted by a challenge, Titanium Fireworks proposed a radical departure from previous years, with a purely pyrotechnic and special effects display fired from six small pyro pontoons located either side of the floating stage. Each pontoon was loaded with flame projectors and a multitude of our ultra-low debris close proximity single shot effects. This was all meticulously choregraphed to a percussive soundtrack to deliver an intense pyrotechnic finale sequence. Once the festival’s creative director and producer were satisfied with our proposal, we had a significant challenge to obtain permission form the Environment Agency and the Health and Safety team to guarantee the suitability of what we were proposing. A number of meetings and detailed site specific RAMS document was sufficient for the proposed display to proceed. Thanks very much indeed for your contribution to last week’s Henley Festival. The results were excellent, we achieved exactly what I was after given the format we went with. Thanks also for the suggestion of the firing track, it worked brilliantly and didn’t clash with anything that had gone before on stage. Titanium scored very highly on the pleasure-ometer and I hope we can work together again.